Diseased farmed salmon is unloaded at Port Alberni and taken to a local composting area. A delegation of local First Nations leaders and anti-salmon farming activists gathered in sight of the loading dock at Fishermen’s Harbour in Port Alberni on the morning of May 22 to witness the unloading of thousands of Atlantic salmon infected with infectious haematopoietic necrosis (IHN) from the Mainstream Canada fish farm at Dixon Bay. The virus, which is lethal to farmed Atlantic salmon, was detected at the site, one of 16 farms on Clayoquot Sound, last week, and the company moved quickly to collect and dispose of the diseased fish using biosecurity measures spelled out by the Canada Food Inspection Agency. But local First Nations were not notified of the plan, according to Tseshaht Councillor Les Sam. It was well-known fish-farm opponent Alexandra Morton who notified local stakeholders that the Ocean King had arrived with its hold full of dead fish, he said. “It’s all being monitored by the government and some veterinarians. Apparently there is an offloading plan that sanitizes the boats after they are done. The fish are put into pumper trucks and taken to a composting facility,” Sam said. The carcasses, about one kilogram apiece, were unloaded by pump directly into local Walco Industries tanker trucks, and then transported to the Earth Land and Sea compost facility on Seizai Road, near the Coulson Forest Products mill complex. The company mixes fish waste with clean wood chips to produce a high-quality garden soil, through high-temperature decomposition of the organic material. Morton said she fears the facility is too close to the Inlet to prevent contamination of local waters. Morton said it would be appropriate for Mainstream to provide samples to First Nations. In a media release issued Tuesday, Mainstream Canada said testing conducted by the provincial Animal Health Laboratory had earlier in the day confirmed the presence of the IHN virus in a cell culture. Jensen said that while the final genetic profile wasn’t completed until Tuesday, all indications pointed towards IHN. “Rather than sit around and let things get worse, we took the hits,” she said. According to the company, however, the cell cultures tested negative for the ISA and viral hemorrhagic septicemia(VHS) viruses and the pathogens that cause bacterial kidney disease (BKD). Sam said his concern was the possibility that the vessels may have leaked a blood trail all the way up Alberni Inlet. “When we’re fishing in the river and we rinse out our totes, you can see the [salmon] fry feeding on the blood. It attracts all kids of sea life,” he said. Any contaminated blood would move directly into the food chain, and that would endanger wild salmon stocks, Sam said. Jensen said transporting the fish directly to Port Alberni by boat, with sealed bilges, was the safest method, rather than off-loading in Tofino and shipping the carcasses by truck. Jensen emphasized that her greatest concern was the behaviour of the crowd gathered to witness the offloading at both ends. 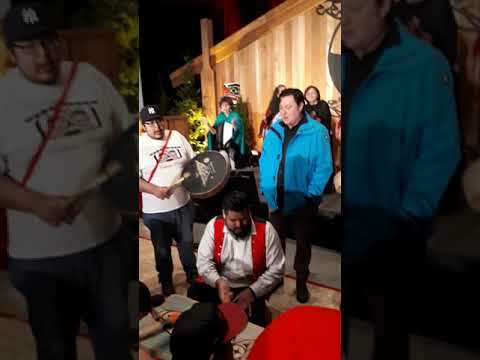 Ahousaht Chief Councillor John (Johnny O) Frank said the episode pointed at a need to keep in closer touch with other First Nations when emergencies like this arise. “That’s something we really need to think about,” he said. Frank said Mainstream informed Ahousaht “in full detail” about the IHN infection as the investigation unfolded, and about the disposal plan. Sixty Ahousaht members are employed in the industry full-time, Frank said. Frank said while the IHN infection at Dixon Bay represents a crisis, it is important to keep the disease in perspective. “IHN is not a hazard to humans and wild fish carry it,” she said. Sam said the incident appears to have put everybody on a “fast learning curve,” and he hopes Mainstream Canada becomes more diligent about notifying First Nations.